That’s the slogan for the under-construction, 43-acre Sierra Bloom Wellness Campus in the northwestern corner of the Salt River Pima-Maricopa Indian Community. Sierra Bloom hosted a groundbreaking ceremony on October 30 after years in the making. The project is along 90th Street, near Loop 101 on the edge of the Community. SRPMIC President Delbert W. Ray Sr. shared remarks and Council member Thomas Largo gave an opening prayer at the groundbreaking. Landowners were also on-site to participate in the ceremony. The theme of the groundbreaking was the commitment it took to reach this point. Ten years ago, Chuck Kennedy, with Sierra Bloom, said his vision for the project was all retail, but with the down market at the time and money tight, it didn’t come to fruition and it would “have been just another” retail project. Instead, the landowners came to him and worked out a deal for him to hold onto the property without quickly developing it. During that time, some of the landowners passed away and won’t see what’s to come. “I wish everybody was here from the inception; many of them were very excited and our biggest supporters,” he said. Ray recalled discussions about the property as far back as 17 years ago. The wellness campus will include assisted living, a behavioral health hospital, medical office clinic, a hotel, retail amenities and build-to-suit space. To see more construction details, visit www.sierrabloom.com. Native American–owned company Arrowhead Construction, which is new to Arizona, is the general contractor. 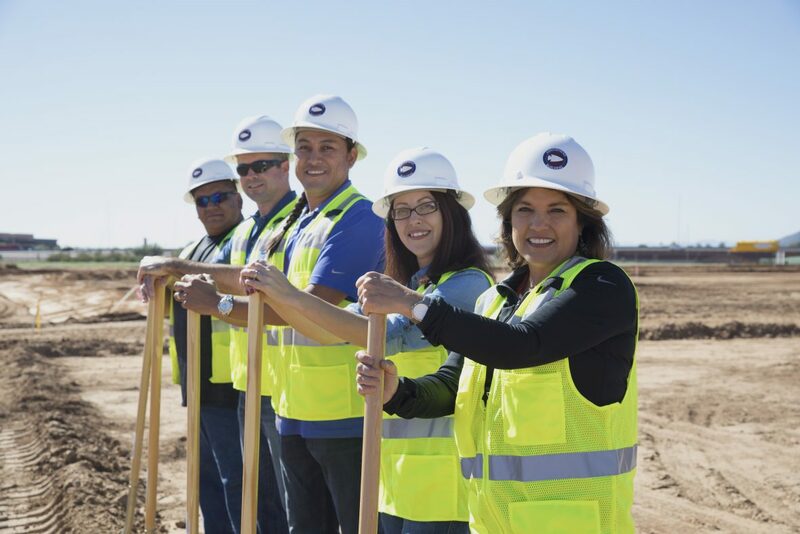 Kari McCormick, vice president of client relations, represented the company at the groundbreaking and shared her connection to the area. She grew up just north of the construction site, and her mother was a teacher at the old Pima school and moved to Lehi to teach children.